- We Manufacture Merchant Ship Models to our clients across country. These models are innovatively designed and manufactured by our experts after detailed research on the requirement. These models come in the small ship shape with the complete image structure of the ship deck and mountings etc. we also Manufacture these Models according to Client Demand. Made with precision, available in small, medium and large sizes. Keeping in sync with the latest market norms and policies, we are indulged in providing a high-quality range of Wooden Warship Model. 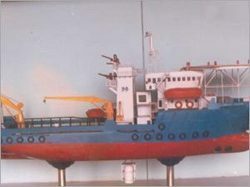 Our company has gained name and fame in presenting Wooden Ship Model. We are engaged in offering high quality IAC Ship Models. These are made of high quality raw material and are designed in accordance with the design of the original ships. Being scaled down version, these models incorporate the minute details and boast of superior finish & build quality. The clients can avail similar models from us at reasonable rates. We have museum quality ship models.